Since 1996, Amanda and the team have trained the following horses to win or be placed in the following Heritage Handicap races. 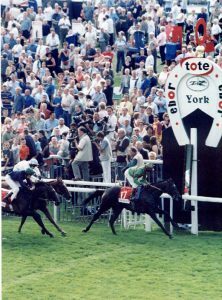 Give The Slip (1st) in the Tote Ebor Handicap at York ridden by Pat Eddery and owned by John E Bodie. Bangalore (1st) in the Fosters Northumberland Plate Handicap at Newcastle ridden by Seb Sanders and owned by Mike Dawson. Bangalore (1st) in the Tote Chester Cup Handicap at Chester ridden by Gary Bardwell and owned by Mike Dawson. Zhui Feng (1st) in the Royal Hunt Cup Handicap at Royal Ascot ridden by Martin Dwyer and owned by John Connolly and Odile Griffith. Tillerman (1st) in the Tote International Stakes at Ascot ridden by Mick Kinane and owned by K Abdullah.